I'm so very glad that I took the class. Not only did I do some fun and awesome work with curves, Janice was an amazing teacher! Her command of the subject, her thoughtful organization of the handout and progression of the class, the amount of stuff she packed into a mere three hours - all awesome! She led an introduction to the full group (24 of us in class) and then worked her way around the room to demo the detailed example to small groups. Then, in an act of teaching perfection, she supported everyone in working at their own pace through the four different skill sets being taught by demonstrating each lesson numerous times as small groups were ready. This meant she showed each skill numerous times, but nobody had to wait around for very long before she was demonstrating the next part of the lesson. Even in my exhausted state the class was a wonderful experience. I would take any class Janice taught! I think there's generally two schools of thought on piecing curves: the don't pin technique and the pin the heck out of it technique. We used the pin the heck out of it method. I sewed one seam of the first block, molehill curves, then moved on to the whole circle (12 1/2" unfinished block). We had four sections of the quarter circle drunkard's path units (6 1/2" unfinished), in decreasing size of piece (and increasing difficulty), and I made two of the four sections. I think I was losing steam mentally, and this is where I ran out of time. I did watch her demo on part four: the clamshell, and eventually I'll get to trying that out. I'm not likely to put these four blocks into the sampler that Janice designed for the course. Instead of one finished mini, I think I'll use each block differently. I'd like to make a drunkard's path lap quilt, so I think I'll put that block on the back of my quilt. I may finish the circle block to be a mini of it's own or use it in the center of a medallion style quilt. The molehill and clamshell blocks will most likely be used to make a zipper pouch or some other small project. All that said, these aren't the highest on my to do list, so it'll probably be a while. While I might not recommend taking 21 hours of class in three days at QuiltCon, I'm thrilled with my new skills and new projects. And I'm definitely glad that I took the opportunity to immerse myself in learning while I was there. 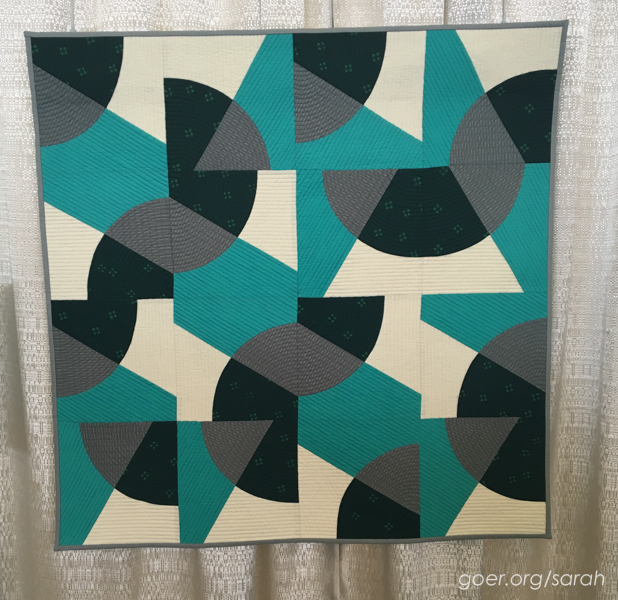 Next time I attend QuiltCon I'll probably be more selective about what classes to take and settle on just one or two in order to give myself a little more balance with downtime and social time for the weekend. The block was created by my friend, Karen Cunagin. I wanted to use it to create a modern piece with a limited palette yet pleasing design. I like the simplicity of using one block and getting the strong sense of both curves and straight lines. Design Source: The block was created by Karen Cunagin and taught in her class at the San Diego Adult Continuing Ed. School. The overall design using her block was my own. Holyoke, Massachusetts was one of the country's first planned industrial cities. The city is powered by a dam on the Connecticut River and a canal system. The juxtaposition of the natural river and the planned gridded streets is fascinating to me. It is also just across the river from where I live -- the little blue star in the upper right is where my house is located. 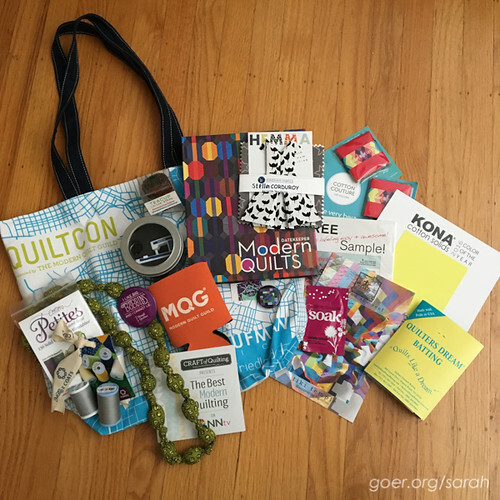 I'm sharing some of my goodies from QuiltCon with one of you. I'll draw one winner on March 24th (tomorrow!) 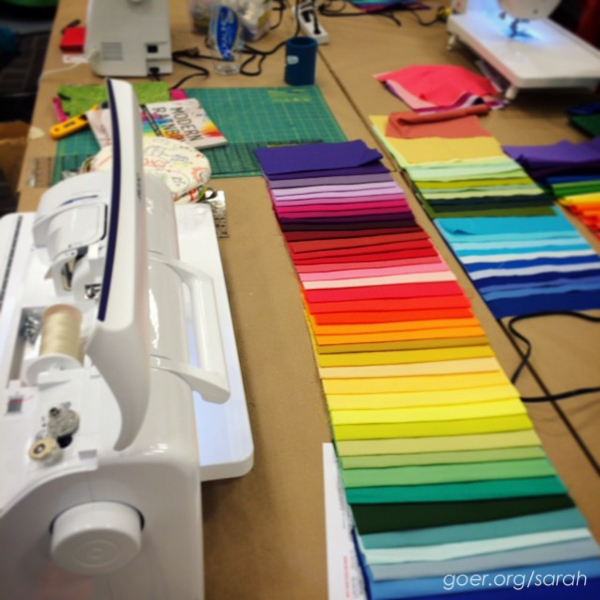 at 1pm PST out of all entries on my five posts about my QuiltCon classes. (This is the last of the five posts.) The drawing is open to everyone. To enter, please comment below and tell me about the best quilting class you've ever taken, or a quilting class you'd like to take. Followers can get a second entry by posting a second comment to tell me how you follow me (Bloglovin', Instagram, etc.). Thank you! Thank you to everyone who entered. The winner is Anja of Anja Quilts! Posted in Quilting. 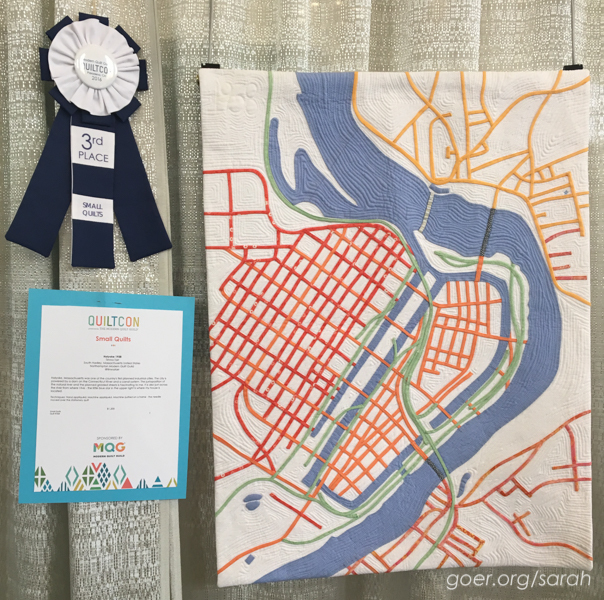 Tags: QuiltCon, QuiltCon 2016 on March 23, 2016 by sarah. 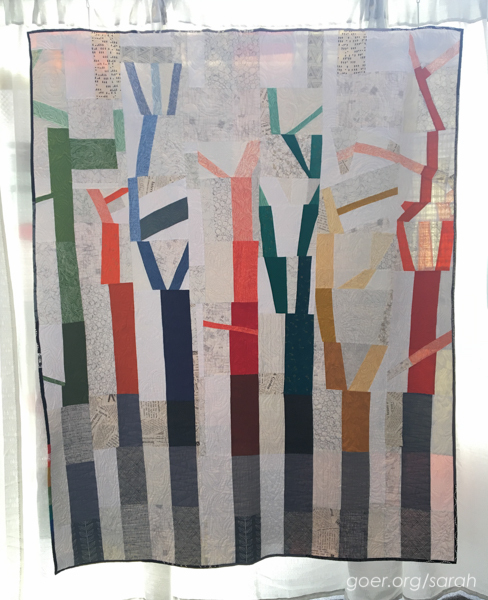 Saturday morning I took a six-hour class with Rebecca Bryan to make her Rainbow Remix quilt from her book Modern Rainbow. The book is filled with beautiful, rainbow eye candy. So many stunning quilts in a variety of styles! 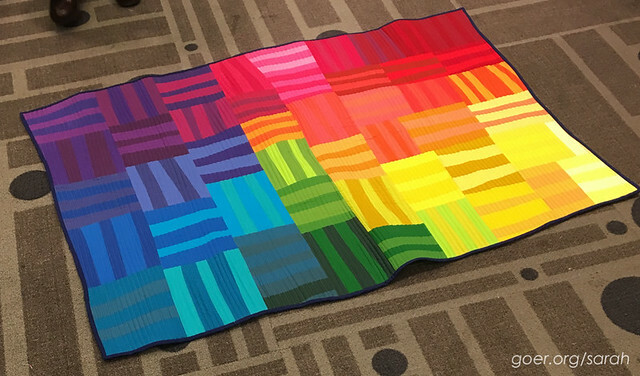 Rainbow Remix is an improv strip-pieced quilt, which calls for fifty 10" squares. I went with solids, like in the book, and I think I ended up with 75 colors, which works great since I'd like a larger quilt. I got my first 22 blocks made during class. Here's a look at Rebecca's Rainbow Remix. She gave a design talk in the afternoon about piecing together the blocks into units to create the quilt top. I'm looking forward to having my completed blocks on my design wall to play around with. Once again I found myself in class with a guildmate. (How fun to have so many common interests with these women I met four months after I signed up for my QuiltCon classes!) She and I have decided that we're going to work on our Rainbow Remix quilts at the May retreat. It'll be hard for me to keep my hands off all that rainbowy goodness, especially since I cut all my strips in class and just need a marathon sewing session to get them sewn together. Luckily, in the meantime I have plenty of other WIPs to choose from, like my improv crosses! I was also in class with Silvia of A Stranger View. 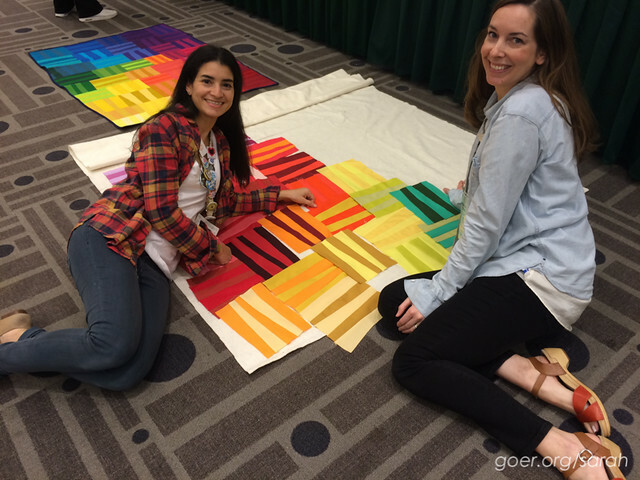 We were new quilt bloggers together and hang out online together on IG and Periscope. It was fun to discover that we had registered for the same class and would get to hang out together. Silvia sent me a few of her photos to share with you. The first is of me working on my rainbow-ish order. The foreground shows a classmate's palette. It was fun to see people working with non-solid fabrics. The second photo is of Silvia's palette. And the last one is of Silvia and Rebecca while they were working on the layout of Silvia's blocks. "Home" is my tribute to everything comforting and natural - to me, this is my marriage. I was inspired by Carolyn Friedlander's Botanics fabrics to machine piece trees improvisationally. I chose low volume fabrics for a contemplative background. The trees each display the range of one color from darkest to lightest. Finally, on my home machine, I quilted woodgrain in the background to represent the rest of the forest, and swirls of wind high above. As Edward Sharpe and the Magnetic Zeros say, "Home is wherever I'm with you." 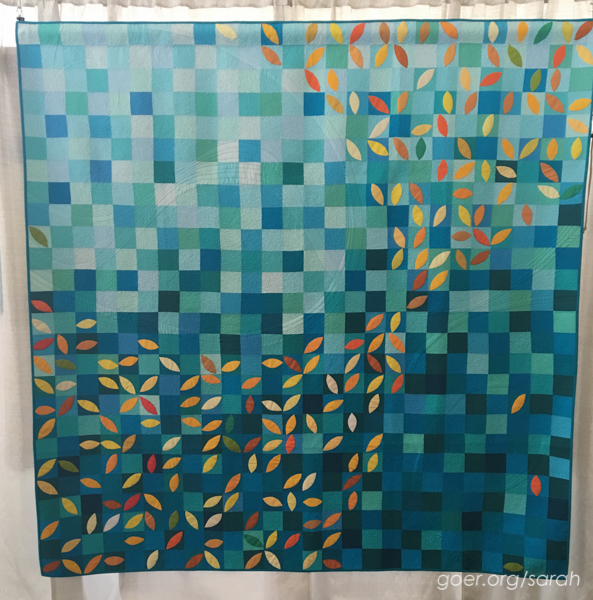 I was inspired by a crisp October day with a deep turquoise sky and the beautiful golden trees. I machine appliquéd the leaves and arranged them as if the wind was blowing the trees and making the leaves flutter around me. Stipple quilting in the background makes the leaves stand out. 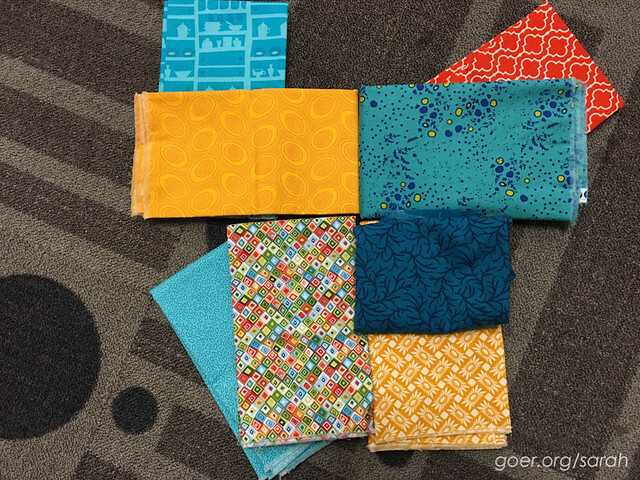 I'm sharing some of my goodies from QuiltCon with one of you. I'll draw one winner on March 24th at 1pm PST out of all entries on my five posts about my QuiltCon classes. (This is the fourth of the five posts.) The drawing is open to everyone. To enter, please comment below and tell me one of the quilts on your bucket list. Followers can get a second entry by posting a second comment to tell me how you follow me (Bloglovin', Instagram, etc.). Thank you! Thank you to everyone who entered. The winner is Anja of Anja Quilts! Posted in Quilting. 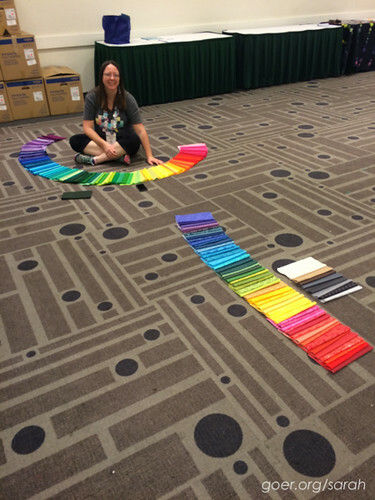 Tags: QuiltCon, QuiltCon 2016, Rainbow Remix on March 19, 2016 by sarah. Welcome to Color Play Friday. I missed last week when they featured a building in Minneapolis. This week we have this photo of a lovely bowl of Starburst candy. At first glance the photo reads as really PINK, which isn't exactly my favorite color to work with. Taking a closer look, there's actually an amazing number of color options in the reflection on the edge of the bowl. In addition to the pinks and reds from the candy, my initial color palette included a variety of blues and jewel tones in purples, blues, golds, and greens. I also had some grey in there as well. As I worked through fabric selection I narrowed my palette. The first fabric I locked on was the Fruit Stand. 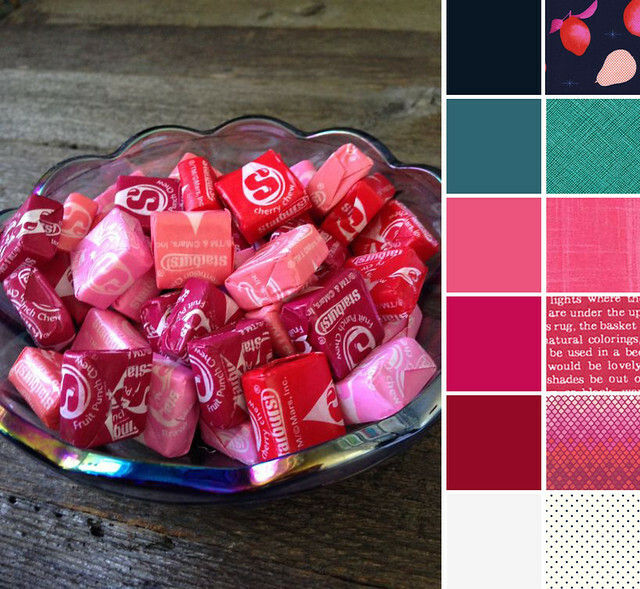 I loved it for the colors as well as the play on the fruit flavors of the Starburst. I wouldn't be surprised if others chose this fabric as well this week! It would have worked in either color way, but I liked that this one brought in the navy color from my palette. And I loved how the Tula Pink Mosaic pulled in all the Starburst colors and worked with the colors in Fruit Stand. From there I moved on to blenders. It's hard to tell from the thumbnail, but some of the print in the Fruit Stand fabric is in polka dots, which is what drove me to add a polka dot fabric to my palette. And while the Ultra Marine Crosshatch is a little out there and didn't match my green swatch perfectly (trust me, I hunted to find a better matching green in the photo! ), I really liked what it added to the overall palette. The Lecien modern text fabrics had a number of possible colors from my original, larger palette and I really wanted to work one in since I love text fabrics. There are NINE of us participating this week. (Links below.) I can't wait to see what everyone else came up with. 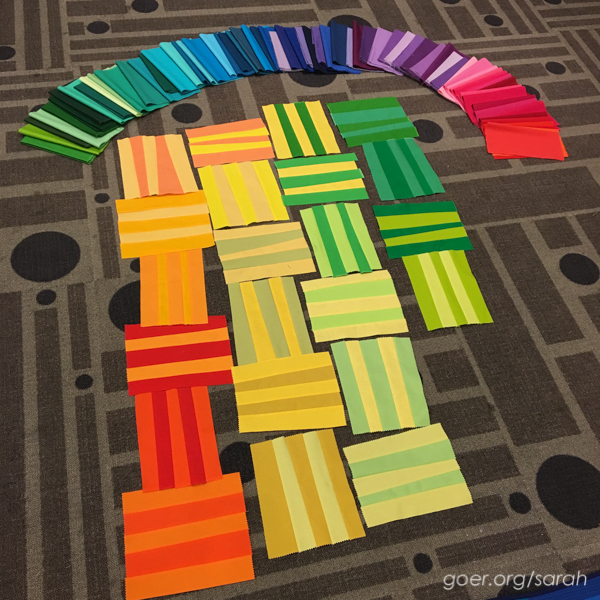 If you'd like to participate in Color Play Friday you can visit In An Otter Life or Laurel, Poppy and Pine for the rules, their contact information, and next week's photo. 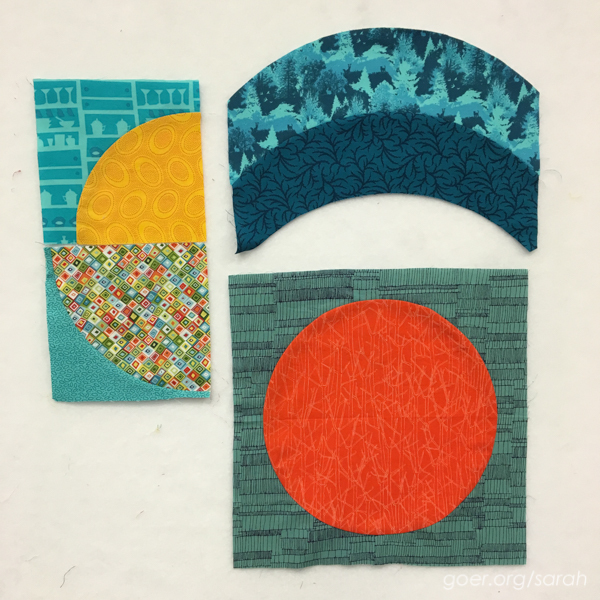 Additionally, this month there's an opportunity to purchase Lorinda's bundle or Trina's bundle (or both) at Stash Fabrics. And visit Lorinda and Trina's blogs for a chance to win their bundles! Posted in Fabric, Quilting. 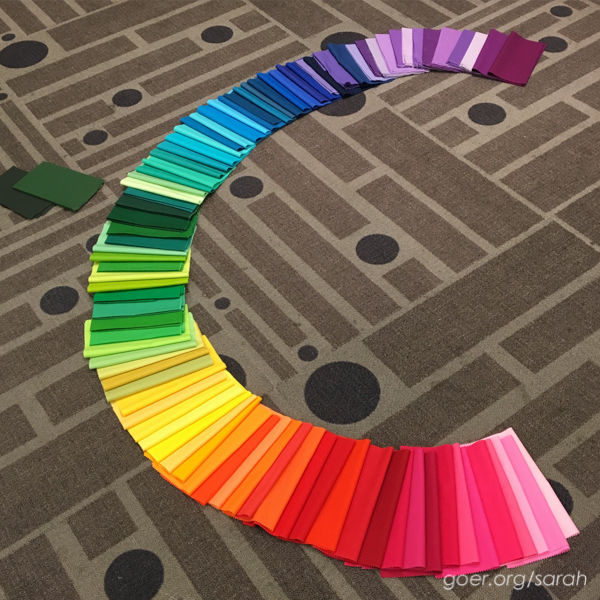 Tags: Color Play Friday on March 18, 2016 by sarah.